For me, being healthy is about feeling good and loving my body at any size. Even when I was heavier, I loved to embrace myself and my body and now that I’ve shed some pounds, I love myself just the same. One of the ways I celebrate my body is through fashion because when I look good, I feel good, and when I feel good I want to treat myself even better. Here are a few outfit ideas you can wear to Thanksgiving dinner that will keep you inspired to stay on track and not go too crazy on the calories. Wearing comfortable converse sneakers are a stylish way to still stay active. In casual shoes that are easy to walk in, you can stay active by taking a quick walk before dinner or even offering to be the last minute errand runner. There’s always something that gets left behind at the grocery store, so instead of waiting around for dinner to be served, be helpful and keep moving. One of my cousins comes to dinner wearing his “eating pants”. Can you guess what they look like? Yup! Loose pants with an elastic band. It’s hilarious when he wears them, but sometimes the button on your jeans can be a great reminder that you’ve had enough. Instead of leggings, stretchy pants, or “eating pants”, try wearing jeans to Thanksgiving dinner and then see if you can get through the night without wanting to unbutton them. In general, the more comfortable my outfit is, the more I move around. 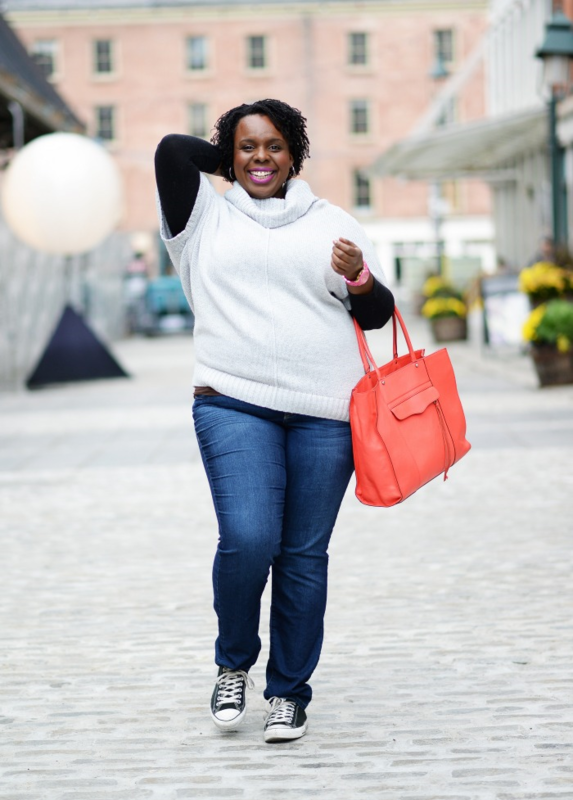 A cozy sweater is perfect for when you want to take a brisk walk or chase kids around the living room, and it’s a great safety net if the jeans you decided to wear do get a little tight around the middle. The truth is, Thanksgiving isn’t a day to think about deprivation, but rather a great day to be thankful for your health, your healthy changes, and to celebrate your healthy habits even while you indulge. Fashion should be fun, just like healthy living should be fun. And, if you’re a fashionista like me, you’ll let your outfit inspire your health any day of the year.